In the third beta, Siri could be used to control Apple Music playback on Apple TV, 3D Touch lag was abolished, and the volume icon in Control Center live-updated as the volume was adjusted. It is this last point that seems to have taken a step backward in beta four. Now, when the volume is adjusted, the icon stays the same. A second or two after it stops being adjusted, the icon will update to reflect the output level. You can see for yourself in our hands-on video. The implementation in beta three seemed a much better user experience, but we will have to wait until public release to see if the change was purposeful, or a bug. We also saw some nice performance gains in beta four. There was an average of a 50 point gain on the single core Geekbench test, and an almost 300 point increase on the multi-core. iOS 11.4 will be the next major update to iOS 11 and will (presumably) finally see the release of AirPlay 2 and Messages in iCloud. Alongside iOS 11.4 beta four, Apple also released the fourth betas of macOS 10.13.5, tvOS 11.4, and watchOS 4.3.1 on Monday. 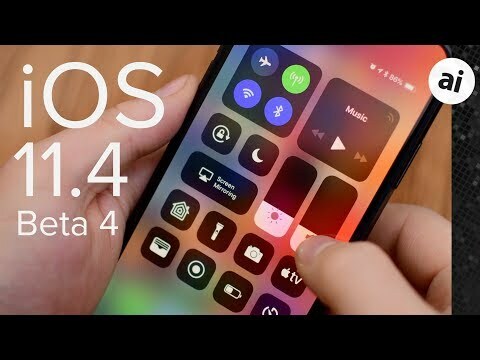 Be sure to check out what was new in iOS 11.4 beta three. To clarify, this is comparison to beta three, or in comparison to 11.3? This is just in comparison to the third beta. Which, as it happens, is still a bunch above the 11.3 release. If you found a trivial UI bug, like a slow or absent update of the volume control slider, you should just send a report to Apple, rather than use a national forum like AppleInsider. I see no value in announcing to the world that a product labeled beta has a bug. Apple have gotten HORRIBLY behind in bug management, starting with many iOS 7 bugs that are STILL present in current versions. The more negative press Apple get over bugs, the better. The mythical feature. Right up there with Time Machine backups to external HDDs back in the day. I hope Apple is working on design consistency within iOS. Benjamin Mayo wrote a piece documenting some of the inconsistencies within Apple’s apps. An example below is the different share sheet icons across apps. In Apple’s human interface guidelines (HIG) they talk about consistency and not confusing users but they don’t seem to follow it themselves. It’s as if there isn’t a human interface team at Apple and every app team can do whatever they want. And only a few years after introducing iOS 7 some apps like music and news introduced large, bold fonts. And why does the notes app still retain skeuomorphism with the textured background and letterpress effect? What exactly does Apple’s HI team do? I see no differences in those icons that would "confuse" me, or even my wife, who is almost technophobic.